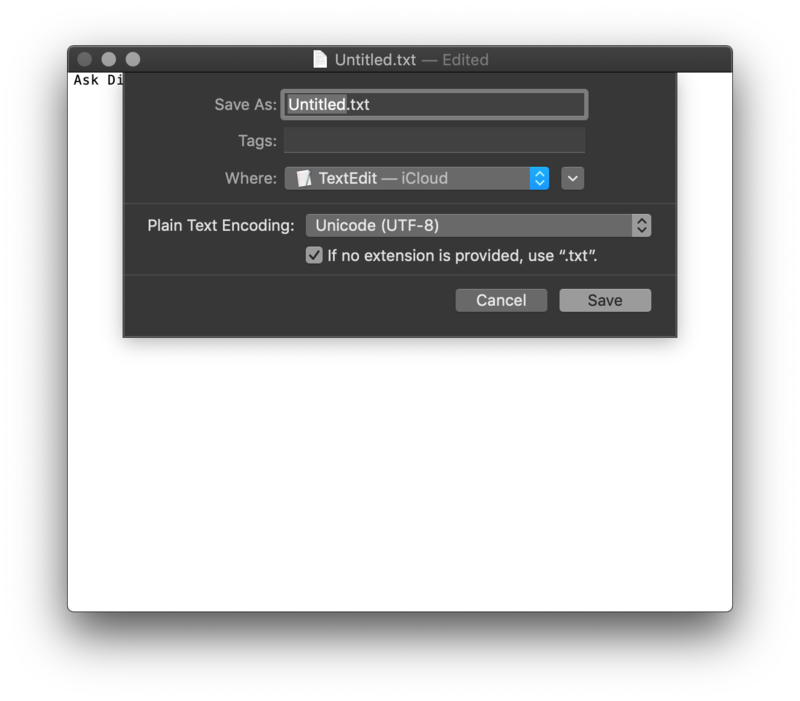 I'm not seeing an option to choose plain text encoding (.TXT extension) when saving a file in TextEdit.app in macOS. My documents seem to all be rtf - rich text format. 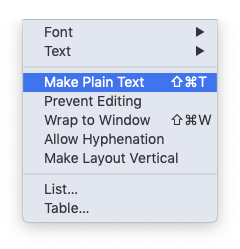 With TextEdit in focus, select Format → Make Plain Text option in the Menu bar or use the keyboard shortcut Shift + Command + T to change the file encoding to plain text. This will also set the extension of unsaved file to .TXT from the default .RTF. Now, save the file normally by invoking File → Save... in the Menu bar, or using the keyboard shortcut Command + S to save the file as plain text .TXT file. In the Text Edit preferences, you can choose to default to plain text if you don't like the shipping setting of RTF. Also, this can be saved per document so you can clean things up to encode and save any existing files into plain text. Since plain text discards data, there is a change to review and undo this change before you save your file. After you take that chance to see what information may have been discarded before you save. If you are saving to a local Mac volume, you can also undo that save if needed. If you are saving to an external system, multiple versions and undo across save is not available. If you have an existing .RTF file you have to convert it in to Plain Text whereby loosing all formatting. Text Edit knows the user selected file format and it will automatically save it it the right format. If you want to create and Save new files in Plain Text format, change the settings in Preferences of the Text Edit. Not the answer you're looking for? Browse other questions tagged macos file text file-conversion textedit . 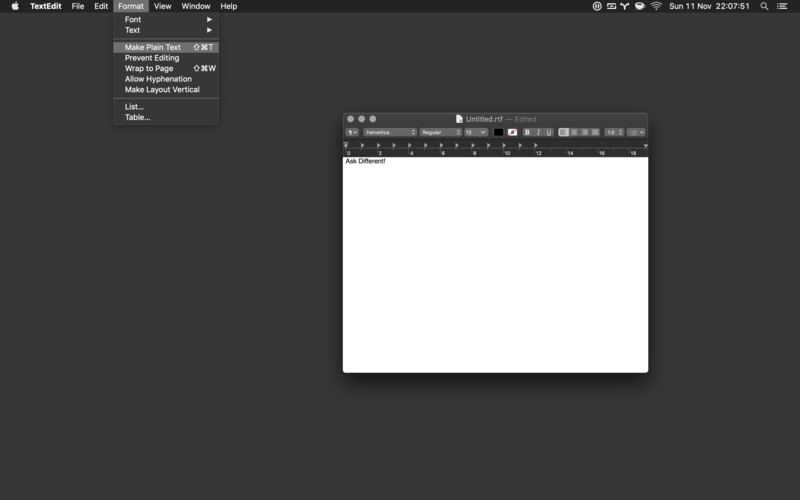 Can TextEdit save as plain text? 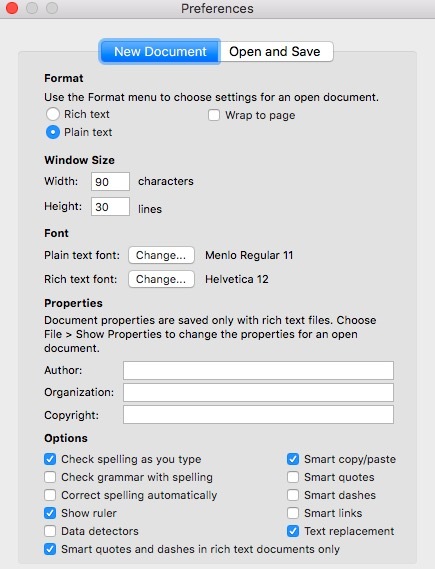 How to open a file as plain text in TextEdit? How to 'linkify' plain text URLs (locally) on the Mac? AppleScript: How to get the character count of an .rtf file?